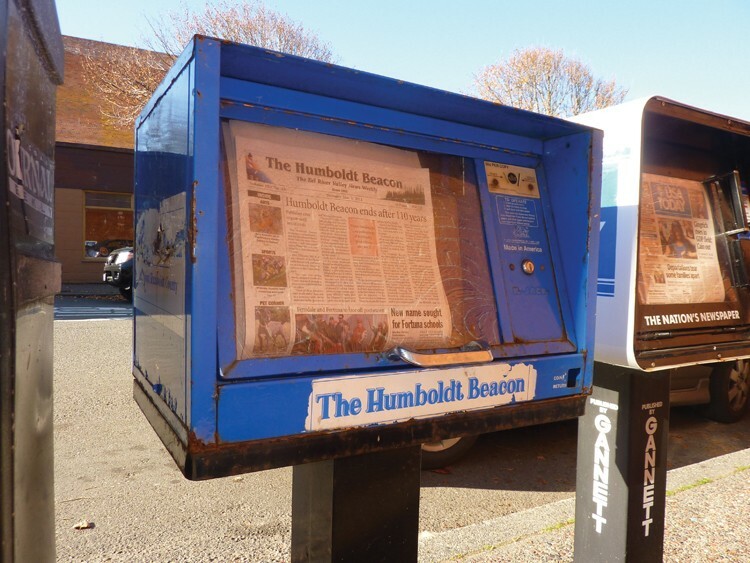 The Humboldt Beacon makes its next-to-the-last stand in Old Town Eureka. In retrospect, Humboldt Beacon Editor Franklin Stover says there were plenty of warning signs for the 110-year-old newspaper. Even back in 2006, when he was hired as a reporter for the Eel River Valley weekly, he thought the subscription numbers (roughly 1,700 at the time) seemed troublingly low. And they've been falling ever since. This past year the drop-off was precipitous. The children of elderly subscribers kept calling to say their mother or father had died, please cancel the subscription. And it didn't seem like MediaNews Group, the Denver-based parent company of the Beacon, was doing much to help matters. Still, when Publisher Dave Kuta told him last Monday that the Beacon would be shut down and his job eliminated, Stover wasn't prepared. "I was stunned," he said last week. "I still am stunned. It's a weird thing how you can know, how you can sense something happening for a long time, but you look the other way and deny what's happening." Many have accused the entire newspaper industry of the same thing -- looking the other way as advertisers and readers flock to the Internet. Newsroom staffs across the country have been slashed, delivery routes eliminated, and venerable dailies like the Seattle Post-Intelligencer and Rocky Mountain News have abandoned print altogether. After buying up newspapers left and right, the Dean Singleton-led MediaNews Group declared Chapter 11 bankruptcy last year. When its holding company, Affiliated Media, emerged from reorganization it held roughly $165 million in debt (down from $930 million) and owned 57 daily newspapers and more than 100 non-dailies in 11 states. For all his empire-building, Singleton was a notorious penny-pincher. The Times-Standard's newsroom staff dwindled from 24 full-time employees when I worked there in 2007-08 (when the Eureka Reporter was serving as a crosstown rival) to 18 today. And the company's new majority stockholders, led by Bank of America, are cinching the belt even tighter. The same day that he announced the Beacon's closure, Kuta also told staff that the Times-Standard -- the Beacon's parent publication and the only remaining countywide daily -- will stop printing Monday editions after Jan. 2. A full-time Times-Standard photographer, Josh Jackson, also was laid off. Kuta said the decisions were made locally after he was asked to reduce expenses. The Times-Standard seems to have come down with the wasting disease that's devouring daily papers nationwide. Is the prognosis fatal? It depends on how it's treated, said Alan D. Mutter, a former editor at the San Francisco Chronicle now working as a media and technology consultant in Silicon Valley. "People still want to know what they want to know -- what's the weather going to be, who won the 49ers game, why is the city making us paint numbers on curbs -- you name it," Mutter said. "There's a real opportunity to be in the middle of that conversation. ... But you have to be good at doing it on the digital platform." When the Internet took off roughly 15 years ago, newspaper publishers got off on the wrong foot by giving content away, Mutter said. Readers now expect free content. Meanwhile, "newspaper publishers have been trying to apply the old print model to the web in terms of the content they deliver, the types of advertising formats they offer and way they sell their advertising. ... The only thing they're doing [differently] is they're doing it in pixels instead of on crushed dead trees." Given these trends, Mutter expects the newspaper business to continue shrinking. Rick Edmonds, a researcher and writer for the Poynter Institute, said more than 100 small- and medium-sized dailies have eliminated at least one print edition per week -- typically Monday's. "When you're in a somewhat smaller and more isolated town, the only thing that's really big news Monday morning is sports results," Edmonds said. Other papers, such as Crescent City's Daily Triplicate -- have gone down to three papers per week. Edmonds said he wouldn't be surprised if that practice continues to spread. But MediaNews Group's new CEO, John Paton, has promised to "spearhead the drive to a digital business model." The company's publications are now overseen by another Paton-led enterprise called Digital First Media. Paton's proposed model for producing content would see one-third produced by paid journalists, another third aggregated from outside sources and the final third generated by community members -- or, as Mutter described it, "getting housewives or shut-ins or whoever to write stuff for a token sum of money." In August, 23 MediaNews Group newspapers including the Times-Standard implemented a paywall, requiring readers to pay for online access to news stories after five monthly freebies. T-S Publisher Kuta said last week that the paywall model is in the trial stage, and jury is still out. (He declined to give online subscription figures.) Many readers have figured out how to bypass the paywall or use their computers in ways that it doesn't show up. Others didn't have to. Jack Durham, editor of the McKinleyville Press and a former employee of the Humboldt Beacon, said, "I never would have known there was a paywall if I hadn't read it in the paper." Kuta said the Times-Standard is steadily increasing its online presence -- posting breaking news stories daily and producing more video. The Beacon will live on, in a sense, with an Eel River Valley news page each Thursday. (The Eureka Reporter also had a token page for a while.) Kuta said there are some encouraging signs: Local advertising is actually doing better lately, and online page views are up since last year, even with the paywall. He expects business to improve when the larger economy does. But the Beacon won't be coming back. Stover, the departing editor, said residents of Eel River Valley towns like Rio Dell and Fortuna will no doubt miss the publication, which he said catered to the uniqueness of those communities while providing good coverage of youth sports. Stover made a point of saying that his local colleagues at the Beacon and the Times-Standard have always been good to him -- though he's not entirely convinced that enough was done at the corporate level to improve the low circulation numbers. Even days later, Stover's was in shock. "I have a mortgage and I don't know what I'm going to do here," he said. The final edition of the Humboldt Beacon will be published this Thursday, Dec. 8.